The Nevins can be traced back to my great x3 grandfather Michael Nevin, who was born in 1821 in Galway, Ireland. His wife's name is unknown, although her surname was Shaughnessy. Michael was living with his son Patrick Nevin & family on the 1901 census, he was listed as 80 years old and a retired farmer. During the 1920s, my great grandfather Michael Nevin (grandson of the above Michael), left Galway for Glendalough, Co. Wicklow, where he met my great grandmother Margaret Connor. They married at Glendalough in 1927 and had 5 children, the second child, Noel, died of pneumonia in 1934. Margaret passed away in 1939 due to kidney disease, she was 42 and buried at the graveyard in Glendalough. Michael returned to Galway during his later years to live with his daughter. He died on 9th January 1982, aged 84. 1. Michael (1897-1982), aged 84. 2. Thomas (1899-1958), aged 59. 3. Patrick (1902-c1971), aged about 69. Patrick died sometime in the 1930s or 40s, my great uncle remembers visiting both him and Bridget in the mid 1930s. Bridget died in about 1943. 2. Noel (c1931-34), aged 3. Michael and Margaret's second son, Noel, died of pneumonia in 1934, while Margaret was expecting their third child. Margaret developed a kidney disease which resulted with her death in 1939, aged just 42. She was buried in St. Kevin's churchyard, Glendalough, leaving Michael a widower of the same age with four children, then aged 11, 4, 3 and 1. Michael returned to Galway during his later years to live with his daughter Bridie and her family. At one point (1979) there were ten people living in the house, Michael, Bridie, her husband, 6 children and baby granddaughter. Michael outlived all 3 of his son-in-laws, Anne's husband James Bates died in 1974, aged 42, due to a brain haemorrhage, Bridie's husband Edmond Maguire died in 1979, aged 59 and Mary's husband William McCormak died in 1981, aged 49, after a heart attack. Michael also suffered a heart attack during the winter of 1981, he was taken to hospital, before returning home on the 2nd January. 7 days later he died of another heart attack, aged 84. He is buried in Galway. 4. Anne Margaret Nevin was born on 7th June 1936 in Glendalough, Co. Wicklow. When she was 3, her mother Margaret passed away, so she was brought up by her father, her other relatives being on the other side of Ireland in Galway. She never knew who her mothers parents were, and she never met her fathers parents, although her grandmother Bridget used to write to them occasionally. 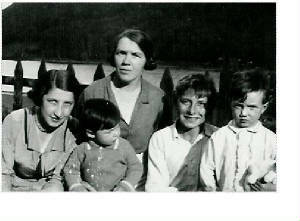 Margaret in the middle with her sons Noel (in front) and Paddy (far right). 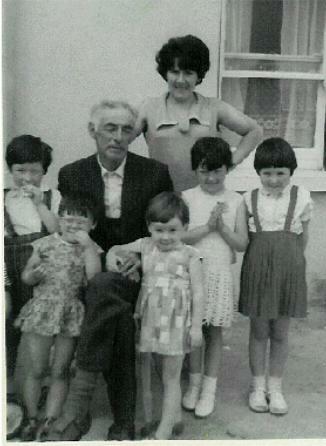 Michael Nevin in the late 1960s with his daughter Anne and 5 of his 13 grandchildren (from left) Eimonn, Carol, Josephine, Angela and Esther. Angela and Carol are daughters of Anne, the others are children of Bridie. Esther drowned a year after Michael died, on 13th July 1983, aged 21. She drowned along with her sister Breda.